A couple of weeks ago, Mayor Greg ballard announced a green infrastructure project which would be located on Ohio Street in downtown. The stretch of sidewalk to be improved (and in this case, improved is the proper term) is between College Ave, and Park Ave. This is the same block that contains the newly, and recently featured here (and here) Nature Conservancy. The project addresses what for many cities today, is a glaring problem. Stormwater runoff management. 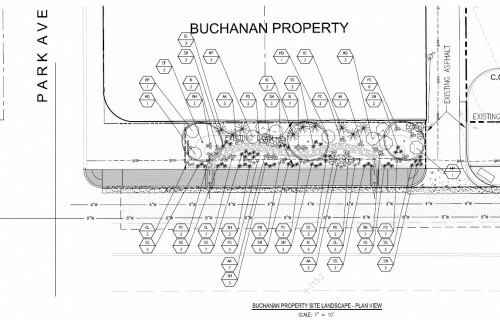 This specific project aims to tackle this issue by replacing concrete and pavement, with permeated pavement and a rain garden. This is the first project of it’s kind to be built in the Indianapolis area in regards to permeable pavement. (at least that we know of). Permeable pavement is a type of pavement in which it allows water to pass through while still performing what we all expect pavement to do, which is support cars, pedestrians, skateboards, etc. The other component of the project, is a rain garden. I was able to get my hands on plans from the city of Indianapolis and put them on display for everyone here. Once completed and in operation, this should remove 1.2 million gallons of storm water annually; or 90% of the runoff generated in this area. 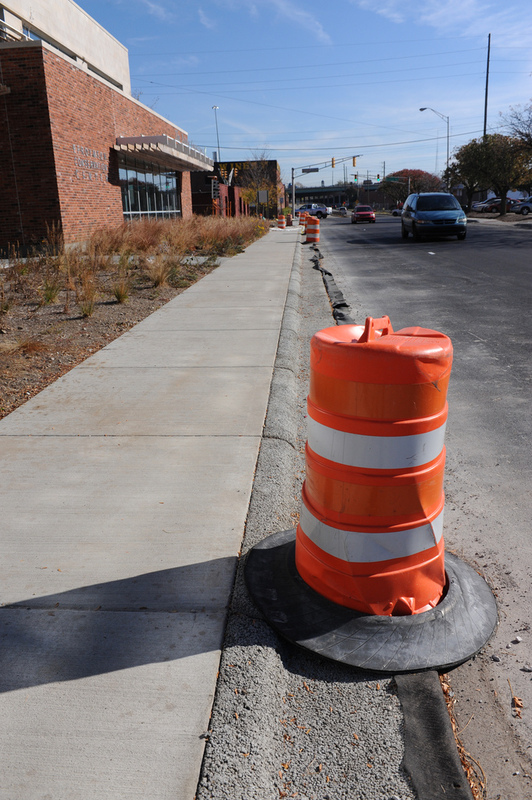 While concrete and raingarden construction has been completed, the city plans to add the vegetation in the spring which will consist of a myriad of plant and tree life. Everything from dogwood trees, to hydrangeas to clover to other assorted perennials and ornamental grasses. 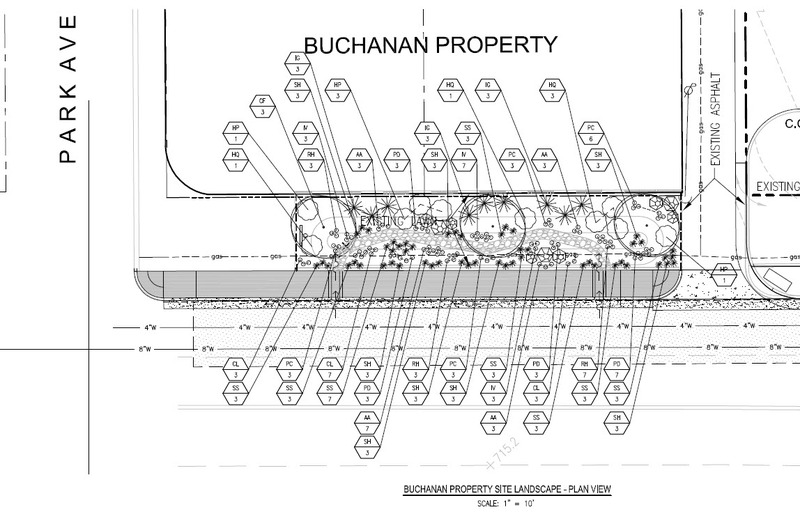 Taking a look closer, the site plan reveals two areas where the curb is broken to allow water to flow into the rain garden itself, located in front of the property owned by Buchanan. This project represents a step in the right direction in our city’s approach to storm water management. While it still doesn’t solve the larger problem of an environmentally equitable, system wide storm water management plan, it represents more symobolism in this block that the rest of the region could learn from. For a 5 page .pdf of engineering plans, click here. Cool project. I just wish they had moved the sidewalk to the building and put the rain garden between the road and the sidewalk. Seems like a glaring oversight. Wouldn’t it have been nice if the new sidewalk ordinance Indy passed two years ago also addressed storm water management and permeable surfaces? Also, Curt, I believe the Keep Indianapolis Beautiful HQ has permeable pavement in their parking lot. The Di Rimini was also supposed to have permeable pavement in the interior driving lanes, but the way things went at that project, it’s doubtful they actually did that. I agree wholeheartedly with Chris about the sidewalk location. The stormwater drainage improvements are great, but NOBODY enjoys walking along that narrow sidewalk right next to fast-moving traffic on Ohio Street. I think everyone needs to just applaud this project even being completed. Indianapolis office of sustainability (and the firms involved in design) jumped many hurtles just to have pervious surface within the right of way. On the surface, its a concrete sidewalk. Period. It used different materials that we should have been using, and have been used in other places, before this. I am happy that this project is coming to fruition, but Im not going to give it a pass on being the end all be all of green projects when some portions could be improved. Thanks for featuring this project on your website. I’m the project manager for this project, and I just now found this article – sorry for my tardiness in the discussion! I’d like to address a few of the comments made above. There were several discussions about where to locate the sidewalk: up against the curb, or further back towards the ROW line. We chose to locate there for several reasons. 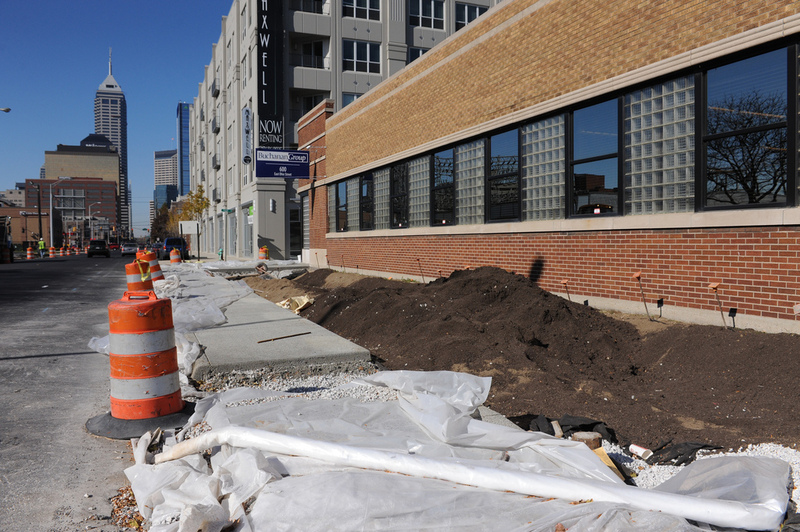 First, putting the sidewalks back in the existing location is always better for costs and possible interference with underground utilities. Second, although the project team (which actually solicited the opinions of the adjacent property owners) agreed with you that a sidewalk up against the curb of a very busy street can be unpleasant for a pedestrian, we felt that this neighborhood would maintain its urban character if we kept the sidewalk location urban – as opposed to suburban, which is to take it off the back of the curb. Third, since we were doing porous (or pervious, same difference) concrete curb & gutters, we knew we’d already be excavating in that location (reducing costs), the infiltrative base layers for the sidewalk & curb could be tied together (reducing costs), and the two porous concrete features would both be more stable if they abutted each other (improving their durability). So yes, we definitely looked into that. I agree with you in that the City ought to do more of this – porous concrete & rain garden combo – to provide both a pedestrian benefit and a stormwater solution. You may even think it should happen EVERYWHERE in Indy. The thing that needs to be understood is that this type of material must be strategically used to ensure it’s long term success. A few factors that determine when/where/how it should be used are: 1.) location, location, location (soils, soils, soils), the native soils must be porous soils, not the heavy clay that are pretty common in Indiana. This site sat on sands and gravels, so it was very infiltrative. We got lucky! If the native soils are not infiltrative, you often get upside down on the cost to amend them or increase the depth of the aggregate base. 2.) Existing infrastructure (which plays in big to costs). Especially in an urban setting, you must be very careful not to introduce water around buried utilities. Fiber optic lines don’t like it wet, so you have to be able to get enough separation to prevent interference. Also, are you in a CSO area, or is there already a separate storm sewer? What will you tie your overflow structure into? Are the soils contaminated? Well-head protection area? All those things matter when you’re trying to infiltrate stormwater into the native soils. 3.) Maintenance. Porous concrete requires more and different maintenance than typical concrete. you have to vacuum the fine particles out twice a year to maintain it’s porosity. Otherwise, it plugs up and doesn’t do it’s stormwater duties. That costs money. That’s where proving the stormwater benefit is critical – to show the value of a dual-purpose “sidewalk” – porous concrete sidewalks, curbs, and gutters aren’t just for walking on….they are a stormwater management tool, also. Okay, sorry if I geeked out for a minute on porous concrete. I’m kind of a big fan. But more importantly, I’m a big fan of it where it make sense and can save the taxpayer some dollars. Thanks for visiting and enlightening us on the project. Interesting information about the sand vs. clay soils.